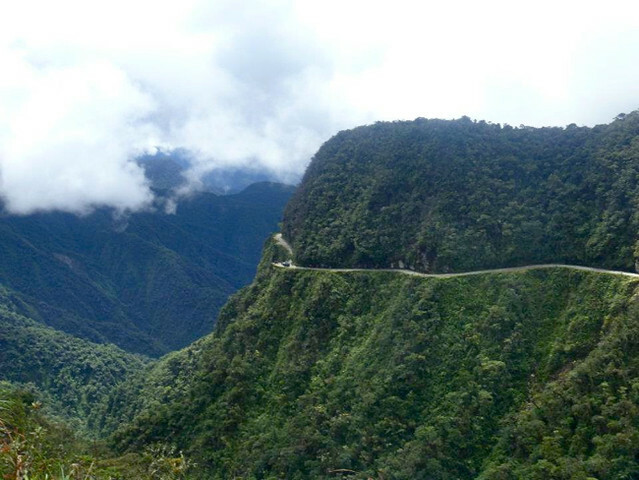 The so called “Most Dangerous Road in the World” or sometimes more bluntly, The Death Road, is a 61-kilometer road leading from La Paz to Coroico in Bolivia. It is notorious for the numerous death and accidents since its construction in the 1930s. The extreme drop-offs, mostly 3 meter single lane width with no guard rails made the road extremely dangerous, specially big vehicles. Also rain, fog and dust usually cloud the visibility. Ironically (or not), the danger of this road made it a famous tourist attraction. In the early 90’s, some thrill-seeking mountain bikers decide to ride down this 61km stretch of continuous downhill path. Since then over 50,000 people ride down this route every year. Tour operators sprung around La Paz catering to this activity offering guides, equipment, and transport like those car hire menorca. I don’t remember if I’ve known of this before coming to South America, but if I did, it was for sure not on my list of things to accomplish in south america. I’m not really confident in bicycle. Well, I was when I was a kid and up until a couple of years ago, always believed that you never forget how to ride a bike. Well, you don’t forget alright, but the proficiency certainly isn’t as before. When I was in China in 2008, the group I was traveling with decided to rent a bike to ride along the beautiful countryside of Yang Shuo. When I hopped on a bike for the first time after 10 years, I found I didn’t have the same control and couldn’t even smoothly negotiate a right turn! It was a WTF moment because riding a bike was one of those things I thought I could depend my life on. 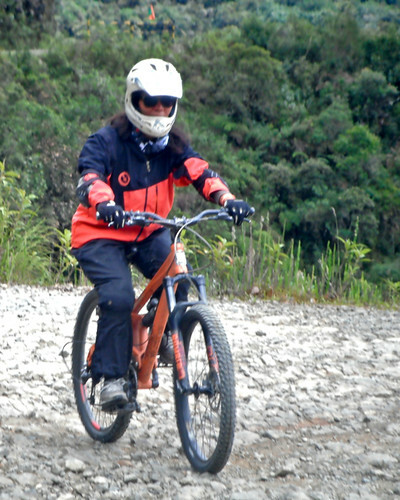 I survived that countryside tour, and since then have been trying to gain back my riding confidence by going on a bike when I can while traveling. I probably should do it too at home, but it’s just not a popular form of transport. During this round the world tour, I did a wine tasting tour on bike in Vienna countryside and a monumental 20km ride in Holland, for example. But still, those can’t prepare me for an adventure with “death” attached to its name. And statistic shows there are a number of riders who died on this road, most recently, a Japanese girl. But since getting to South America, I met so many travelers who did it. In the beginning, I always quickly say no, I’m not doing it but the more it came to the conversation, particularly as I was getting nearer to Bolivia, it began to creep into me that maybe I can do it? Bungee jumping in Costa Rica often came to mind. I started to seriously consider it when I spoke with Markus, a guy I was in Brazil carnival with. It was not as scary as everyone thought, he said. That it was all marketing and that unless one is doing a stupid stunt, it’s impossible to die. That 3 meter wide road is more than enough space for a bicycle. He even went on saying that if I do fall off the road, he will go back to Bolivia and jump after me. Finally, I came to La Paz but still wasn’t decided 100%, but I did book into a hostel with a reputable tour agency for death road. I obviously wanted to do it, just that I was terrified. I kept thinking how stupid it would be to pay to die. However, the statistic of people dying on this tour is less than .002%. Then one night in La Paz, I met 2 girls who I quickly connected with, Amanda & Fiona. They were going to do the Death Road and like me were nervous about it. So while downing 2-for-1 vodkas 1 after another during happy hour, we made a pack that we’re doing it together, the day after tomorrow, allowing ourselves 1 day to recover from hungover. There are over 100 sellers and resellers offering death road tours around La Paz, but I was only looking at 2 companies that have good review in Trip Advisor, Vertigo or Overdose. Gravity Assisted which is affiliated with my hostel is also reputable but more expensive at 700 Bolivianos ($100). The 2 former companies are cheaper at $70 yet with better protection gear: helmet, jacket and pants, elbow and knee pads. The later only has helmet and an orange vest. The girls were staying in another hostel, so we agreed that if Vertigo shop is open, we book with them, if not Overdose. I woke up late, not surprisingly, and had plans to meet with other travelers, so I decided to book my tour online. You can book online with Vertigo and not with Overdose, so I just hope that Vertigo shop was open and it’s where the girls book their tour. But of course, it wasn’t and we’re with different companies. “I’m so scared!” was my greeting to everyone when they came to get me at 8:30 a.m. Almost everyone were so confident including an older couple of over 60’s. There was a girl from Australia who were as uneasy as I am which helped make me feel not so out of place. 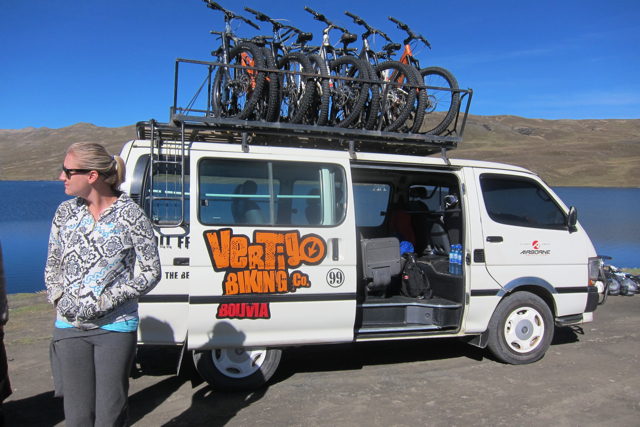 At 9:30 a.m. the van stopped at a flat wide area at “La Cumbre” where we were fitted with our gears and given our bikes. 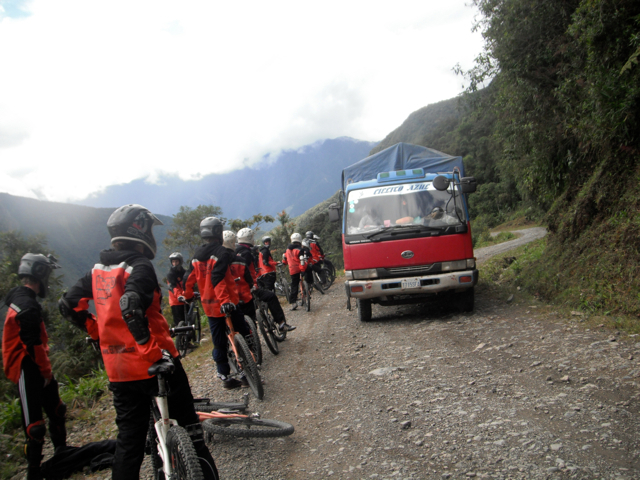 The guide explained the bikes, routes, and gave us the guidelines and warnings. I was listening very carefully. 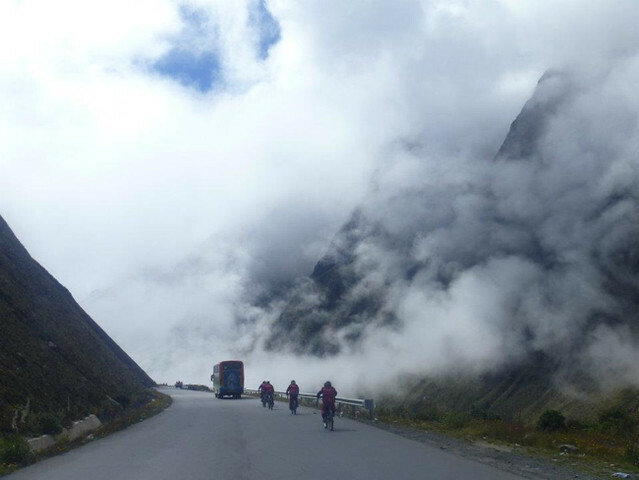 The tour didn’t start at the Death Road, but downhill none the less. This is a 20km stretch of paved (and wide) road which should help us be familiarized with our bikes. We began at elevation was 4,650. The scenery was amazing. Included in the tour is someone taking video and photos so we don’t have to do it ourselves. According to the grapevine, some girl fell off because she was taking photos. Some of the guys in my tour have cameras. I wish I had mine because the photos taken by the guides were not that nice, but obviously I was very concentrated on just making through this tour alive that I didn’t bother bringing it. I should have. I would have stopped to take photos. I was always the last one to arrive anyway. There would always be some kind of pit-stop every 30 – 40 minutes where we’d take some photos, or more instructions were given. 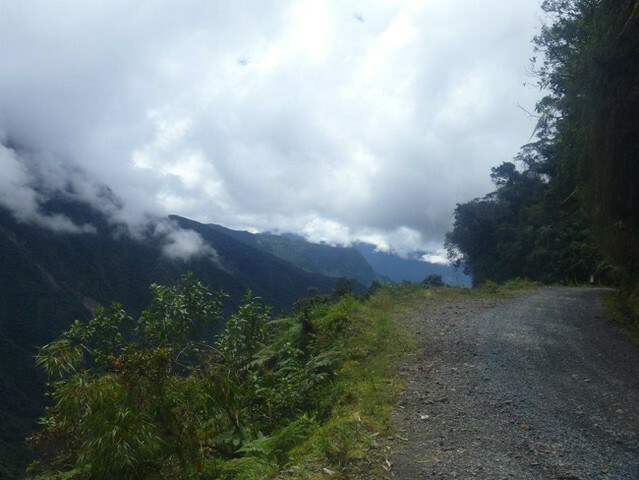 About 11:00 a.m. we arrived to Unduavi where you have to pay a toll 25 Bolivianos to enter the Death Road. Since 2005, a new (better) road was built for the cars, but some still uses this as a short cut. 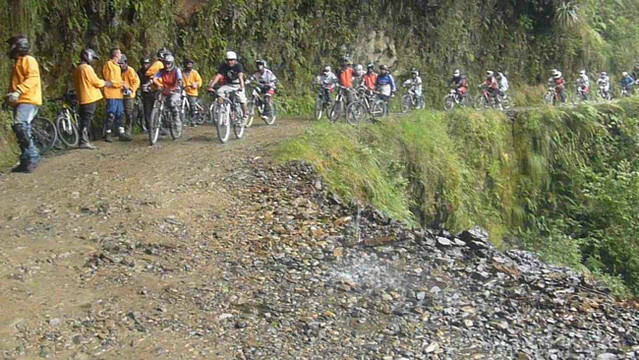 The Death Road is almost exclusively for this bike tour. We got some sort of snacks which I ate but didn’t taste. The first segment helped but I was still so nervous. A new set of instructions and guides were given. The road is going to be steep, narrower, slippery, bumpy with sharp to hairpin corners, be careful! Because the road was indeed rocky and bumpy, I couldn’t apply my break without falling, so I just held on to my handle and ride it gravity assisted! I didn’t fall, not once, not even at the bumpiest part, where a couple of my tour mates did. I actually felt that I learned how to bike better. I’m sure I did, why not? It was the longest bike ride of my life. And because I was concentrating on not falling, my aeroacrophobia became secondary. And by the end of the death road, about 2:00 pm, I wasn’t the last one to arrive! Very impressive! Not being the most savvy of biker riders and lacking in any sort of coordination, you won’t find me doing this! Hats off to you Lil! To seek adventure, there are always risk behind. I can feel the adrenaline rush! But still can’t be convince to ride a bike that high, famous of the death tolls.